Tag-Out should be applied immediately and kept active in order to pattern deer to your Tag-Out holes. With time, more and more deer will find the site and change roaming patterns to accommodate it. Spring - Tag-Out hole activity by lactating does, and by bucks using up mineral reserves growing new antlers. Summer - Tag-Out hole activity by both does and bucks, to aid in several areas including digestion and antler development. Fall - Tag-Out hole activity continues through the fall as deer begin preparing for cold weather. Winter - Tag-Out hole activity continues throughout the winter, however, during the rut doe activity should stay steady, but buck activity may decrease. Tag-Out holes are often used by rutting bucks as a scrape as they look for the does that have frequented the hole. The minerals in Tag-Out play a significant role in deer body mass and antler size. Deer antlers contain several different minerals; and two of these, calcium and phosphorus, make up approximately 30-35% of total antler weight. 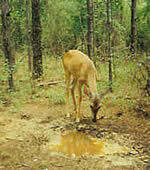 The amount of phosphorus in a deer's diet is also directly related to its body size. Therefore, providing a year round supplement of these important minerals will, over time, help you produce the biggest bucks with trophy racks.